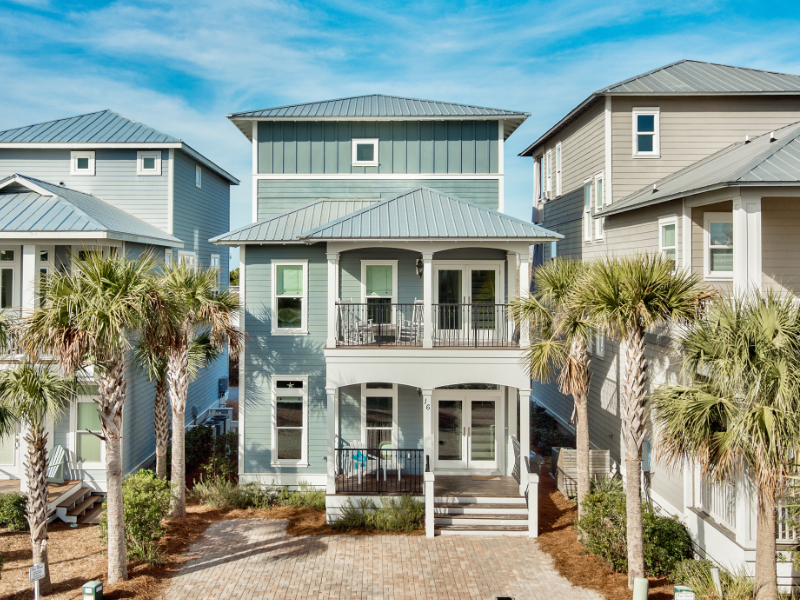 Opened December 1st, 2014, Sunset Jubilee is a new construction home featuring one of the largest outside covered living decks in Seacrest Beach. From the “UPPER DECK,” you can watch the sunset over the ocean or enjoy your morning cup of coffee watching the sunrise or the shrimp boats. Enjoy cooking your dinner from the outdoor kitchen while you spend your evening in this entertaining living space as we have a 47 inch HDTV, dining table, couch and chairs so that you can RELAX and ENJOY the VIEW! Sunset Jubilee is a professionally decorated, three-story house perfect for a two family rental. From the moment you arrive you will be greeted with comfort and style where every room is equipped with a wall mounted flatscreen TV! On the first floor, you will find a bedroom with a Queen bed and a twin daybed with a full bath. As you follow the hallway to the back of the house, you will enter to the open kitchen, dining room and living room area. Enjoy cooking in this fully stocked kitchen, featuring stainless steel appliances, granite counter tops and a special drink refrigerator. Our custom kitchen table can seat 12-14 people. Step outside and you will find a gas grill, beach shower and room for the kids to play as our house backs up to Alys beach and we are on a cul-de-sac. On the second floor you will find a master suite with a king size bed and a deck with a view of the ocean. This master bathroom has a rain shower with a handheld shower perfect for getting the sand off from the beach. This master bath also has double vessel sinks and a deep soaking tub. The second master suite has a king size bed, a deck and a shower with a rain head and a handheld shower. Sunset Jubilee has a tankless water heater which you will be thankful for while you are taking your luxury showers in the master bathrooms. The third floor hosts one large bunk room for the kids that sleeps 7 and has an XBOX 360 with games to keep the kids entertained. The third floor is where you will spend most of your time relaxing and enjoying the view from our spacious deck. Sunset Jubilee is a short walk to the amazing 12,000 square foot Seacrest community pool with waterfalls, fountains and 2 bath houses. In addition to the neighborhood pool and beach nearby, the shops and restaurants of Rosemary Beach are with in walking distance, where you can rent bikes, grab a cup of coffee, browse the shops and enjoy an ice cream cone. Our kids love to scour the candy shop at the Sugar Shack at least once or twice during the week! There are also award winning restaurants within walking distance, for everyone’s tastes including steaks, seafood, pizza, Mexican, & Italian. You don’t want to miss Charlie’s donut truck in Alys Beach which offers gourmet donuts until they are sold out. It’s a motivation for our kids to wake bright and early and walk or bike over for some gourmet donuts – A delicious beach tradition! You can rent chairs on the beach, play volleyball, or just sit back and relax. Our goal is for our guests to fall in love with this house and the incredible and unique 30A area, as we have. We will do everything possible to ensure you have a comfortable, memorable stay. Our minimum age to rent is 25. Picture ID will be required!